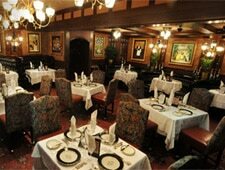 Live entertainment, a lively bar atmosphere and continental-style menu in Newport Beach. : Once a dining institution in Newport Beach, The Ritz now caters to a crowd who comes for the lively bar atmosphere, entertainment and continental-style menu. Appetizers are mostly seafood specialties and range from a Russian-style caviar service to Maryland lump crab cakes, lobster cocktails and Norwegian smoked salmon. The signature egg comes with smoked salmon and scrambled eggs stuffed into an egg shell and topped with caviar, as well as a shot of vodka. However, the best starter may be the escargots en croûte. Mains put an emphasis on classic dishes like rack of lamb and prime rib, and they include a few items that have become harder to find elsewhere, such as calf’s liver and steak Diane. Be sure to save room for the raspberry crème brûlée. The Ritz Bar also offers the restaurant’s signature beef and grilled onion sliders (free during happy hour from 4 p.m.-7 p.m.). Singer and pianist Jimmy Hopper croons soft ballads and easy pop favorites on Wednesday and Thursday evenings.